I knew upon entering the utilitarian Marquis Theatre that my instincts were right about seeing Follies. The theatre, located in a Las Vegas styled Marriott, is hardly known for its charm. But there it was, draped in dingy, droopy, graying muslin. The draping was so authentic, most did not know it was not part of the theatre. The set, (Derek Mclane) so realistically evoked a decaying vaudeville theatre, that I knew attention had been paid.Now I must interject that the only Follies I have seen was an Encores! (staged concert) version. I may not be the most reliable reporter of the event. Follies, while not a hit when it opened in 1971, is a wonderful mix of poignancy, period styling, and Zigfield Follies/Busby Burkeley pageantry. The songs (Stephen Sondheim,) you would recognize many, are gorgeous, and there is more than one show stopper. 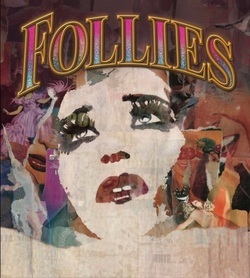 Follies holds an additional, while rare, distinction; it is an incredible showcase for women of a certain age.The premise is a reunion of the Weissman Girls before the closing of a theatre. The Weissman Follies spanned “the years between the world wars” and the reunion is set in 1971. A younger cast is employed to evoke the performers past selves. This would be when I start gushing about the costumes (Gregg Barnes.) I was reminded of those scenes in The Women and That Touch of Mink. You know, when the ladies sit in a comfortable seat and watch the fashion show while mentally choosing what they’ll buy? The 1920s and 1930s costumes were dreamy, as were the 1971 gowns. Mary Beth Peil (Women on the Verge, The Good Wife) was ravishing in a form fitting black stretch gown and cascading gray hair. Elaine Paige was equally gorgeous on the other side of glamor in an electric blue satin gown trimmed in mink. But enough about the clothes. For now.What a cast! The two couples at the center of the storyline; Buddy and Sally and Ben and Phyllis, are played respectively by; Danny Burstein, Bernadette Peters, Ron Raines and Jan Maxwell. Danny Burstein is always fun to watch (if Bert Lahr and Wallace Shawn had a singing and dancing son it would be Danny Burstein) but he is far too young for this role. The problem with a show about aging, and one that announces the characters age from time to time, is there is not a whole lot of wiggle room in chronologically blind casting. Bernadette Peters suffers from this fallout as well. At one point she declares herself “49” and there is sputtering in the audience. I feel certain they meant no harm, it was just so outrageous. Ron Raines is not served well by a declaration of his being “53” either. Both Mr. Raines and Ms. Peters are in their 60s, a fact that is only highlighted by pairing them with Mr. Burstein, who is in his 40s. Ms. Maxwell is probably the only principal who is the right age. If one can suspend reality (which needs to include the premise that a 5’2” Ms Peters could ever be a show girl,) this whole thing should not be such a problem. Although I find it interesting that during a time of such enormous weight given to appearances, that we choose to overlook the obvious for the slightly more subtle which is fame.This would be the time to shout a big hurrah, that Mr. Raines is on the Broadway stage. He is a veteran concert and regional performer, and known to some for his daytime television work (Guiding Light.) His voice is so old school rich and reverberating, it took my breath away. He’s a bit easy on the eyes as well. He was a delightful match for Ms. Maxwell, who tore the place up with her “Could I Leave You.” The lack of chemistry between Mr. Raines and Ms. Peters was perfect for the story. I know I am in a very small minority in never seeing Ms. Peters’ stage appeal. I adored her in the Steve Martin films, but find her voice to be thin and nasally. Her role is not huge, but I was left wondering how incredible it would have been to hear “Losing My Mind” sung by Tyne Daly. I had little time to sulk, as I had the transcendental experience of hearing Miss Elaine Paige sing “I’m Still Here.” I still have chills and a lump in my throat. Now in between all these rich, gorgeous songs brimming with pathos, are some of the best performances you will see on stage. “Who’s That Woman?” is a tap, chorus line, number performed by most of the women. While most of the principal cast are not dancers, Terri White is. She plays Stella Deems and tears up the stage in this number. Holy moly! (Ms. White may be familiar to readers of the New York Times. She was profiled a couple of years ago while performing in Finian’s Rainbow. At 60 years old she found herself homeless.) Her performance needed an Encore desperately. I would not be surprised if one is added (the show is currently in previews. )I suspect that this might not be the quintessential Follies. My guess is that a more appropriate casting of Sally and Buddy would launch this production into the history books. That said, it is without a doubt a must-see!